Boosted by a weaker dollar and generally rising commodities in the wake of the "Greek solution" that was cobbled together late last week, gold prices picked up additional steam overnight and climbed to just above the $1113.00 level per ounce. Last Friday’s S. Korean ship incident was not cited as a supportive factor this morning, as officials appeared to back away from automatically pointing fingers at N. Korea as the responsible party to the tragedy. Still, 46 sailors are missing and presumed dead following an on-board explosion on the military vessel. 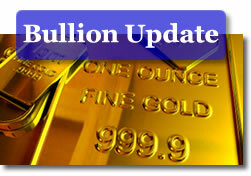 Monday’s trading action opened with pluses in the precious metals complex’ price columns. Gold added $6.00 per ounce to open at $1112.70 this morning, as against a 0.33 loss by the US dollar on the trade-weighted index. The Kitco Gold Index showed bullion’s gains coming primarily ($4.40 of the $6 gain) from greenback weakness, as opposed to robust physical offtake in the market (contributing $1.60 to the overall opening gain). The precious metal has regained some of its footing after the EU agreed on a hybrid EU-IMF assistance package for Greece, but may run into resistance near the $1120 per ounce, and more so, near the $1131.00 price level. Support is currently thought to be found near $1085.00 per ounce. Bullion inflows/outflows were static as regards the gold ETF on Friday –its balances remained at 1124 tonnes. Silver climbed 34 cents at the open and was quoted at $17.21 the ounce. Platinum rose by $16 to reach $1611.00 per ounce, and palladium was $5 higher, quoted at $461.00 the troy ounce. Rhodium was last quoted at $2330.00 bid per troy ounce. Treasury prices as well as the US dollar remained under some (but not as heavy as earlier) selling pressure following the release of a government report this morning that said that US consumer spending rose 0.3 % in February while incomes were unchanged. What a concept! Spending money you don’t have, to buy things you don’t need, to impress people you don’t like. Asian physical gold demand was relatively buoyant over the weekend, despite the sharp gain recorded in bullion values late last week. The next sixty days on the Indian calendar offer the prospects of nearly one million weddings taking place. A million weddings, a million dowries. Many of those will entail gold objects in one form or another, and hopefully not BMWs and/or condominiums units. If the assumptions made by the World Gold Council overnight turn out correct, China’s gold demand might double within a decade. Much of this rosy forecast is predicated upon the continuation of a 10+ percent rate of economic growth in that country. Total Chinese demand reached 423 tonnes last year, as against a 314 tonne domestic supply of the metal. The Council expects investment and jewellery demand to drive the engine of Chinese gold offtake. Others, expect –no, make that, demand- that the Chinese central bank amass more gold tonnage to boost its reserve allocation –currently at 1.6%. It turns out that the market will likely really need such surging demand from China, given its current fundamentals. In addition, even such offtake –provided it materializes- might not be the catalyst for $2K gold as many might expect. (Misguided) expectations, in fact, are part of the problem currently manifest in the gold market. MSN Money Canada asked over the weekend: "What happened to $2,000 gold?" and found that very recently, when gold was soaring, market pundits offering firm predictions of imminent $2,000 an ounce gold were as plentiful as the December snows. So, what –indeed-happened? MSN says that: "Quite simply, despite its charm and legendary allure, gold isn’t immune to the laws of supply and demand. Because the metal has limited industrial use, generates no cash flow as an investment and has very price-sensitive end users in the jewellery market, gold’s value depends on the swing factor of investor demand." Investor demand did indeed swing, and for a long while, in market cycle terms. Credit Suisse analyst David Davis figures that global gold demand just about doubled between 2007 and 2009 as the worldwide financial crisis sent investors reaching for investment tranquilizers and sent gold prices soaring. However, as the U.S. dollar has been strengthening, and the global economy appears to be on the mend, panic-flavoured investment demand for gold has waned. MSN says that: "Once gold crossed the emotional $1,000 barrier last year, new money coming into the gold ETFs dried up, especially from hedge funds and other institutional investors." Actually, ETF demand appears to have hit a wall at about the mid-year mark in 2009, and the balances in these funds have not seen substantial additions commensurate with the spike to $1226 that the metal itself achieved by early December. ETFs shed about 24 tonnes of metal in January of this year. "[David] Davis has attracted a lot of attention from investors and miners for his analysis of the relationships that drive the price of gold. In 2005, when gold was trading under $450, Davis predicted gold would cross over $700 an ounce by 2008 and move to $800 by 2010 as new mine supply dried up. Now, Davis expects a “large oversupply situation” to develop this year equal to approximately 15% of annual gold production, compared with a 9% deficit in 2008. Over the past 20 years, the gold supply has been in a net deficit position on all but three occasions. It’s a rare event for the world to have too much gold — after all, scarcity is its main claim to fame." The Credit Suisse analyst therefore envisions that due to this supply overhang gold might fall back towards the $1,000 level. By 2015, however, Mr. Davis projects gold to be once again valued nearer to $1,150 an ounce, and also figures that gold could find solid price support (due to production costs) at $722. Note the absence of $2K (or dollar 5K or 8K) gold in the above. Last year’s average gold price was $972 whilst the year-to-date figure is above $1105.00 per ounce. The South China Morning Post echoes the Credit Suisse findings inasmuch as it ascertains that almost three months into 2010 it has become clear that "2010 isn’t following the script that investment analysts had written out for it. Go back to the closing days of 2009, and the consensus among financial forecasters was remarkable. The vast majority expected the stock market to rise in the new year, the US dollar to weaken and gold to soar to fresh highs. However, the price of gold has failed to live up to investors’ expectations. Ecstatic gold bugs predicted further gains in 2010, with the price of gold heading unstoppably higher towards US $2,000 an ounce." The S.C.M.P. attributes the decline in prices from last December’s highs to the fact that physical gold buying simply hasn’t been as strong as the gold bugs expected. In so many words, supply versus demand, at work in the marketplace. Moreover, global investors’ expectations of an imminent collapse in the value of the US currency have also not become reality. As a result, they have become a bit more lukewarm on bullion, as reflected in their buying patterns. Meanwhile, -the SCMP observes– "the number of non-commercial long positions in gold contracts on New York’s Commodity Exchange, a key indicator of hedge fund interest, has slumped 25%. As a result, the bull run in gold has run out of steam, with the price slipping back from last year’s high as sentiment towards the metal has waned." The Post concludes however, that: "That doesn’t mean the market can’t rebound. But in the absence of any uptick in inflation or a fresh fall in the dollar or a big central bank purchase to reignite the bulls’ enthusiasm, it looks very much as if gold has lost its shine, at least for the time being." What do we expect? We expect the Friday employment figures to start playing an immediate psychological role in the market. We expect additional volatility ahead of the last trading day of this first quarter and third month, on Wednesday. We expect willing buyers to buy, and in-the-money holders to perhaps sell. In other words, we expect…nothing but the usual. Check out other site market resources at Live Gold Spots, US Silver Coin Melt Calculator and Hot Springs America the Beautiful Silver Bullion Coin.